I made this cake for my friend’s son birthday. I used the wafers biscuits for the railway track. Also, I piped a black track. For the engine, I used the tin for front roll to bake the cake and the other part I used the box cake mix and adjust the cake to that shape. 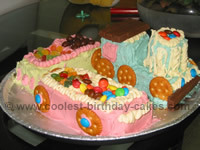 For the middle car I also used the cake mix and cut the cake in a rectangle shape. I connected the cars using royal icing. I used chocolate cookies for the wheels and the ice cream cone and the popcorn were used for the funnel. To decorate the train cakes, I used a star tip, and decorated with icing bags. For the grassland I used a spatula dipped in water to smooth the green icing, then I made the flowers by hand and made the leaves with the leaf tip. For the writing I used the writing tip and for the milestone I used royal icing. For my daughter, Madison’s second birthday, we decided to use a train theme. 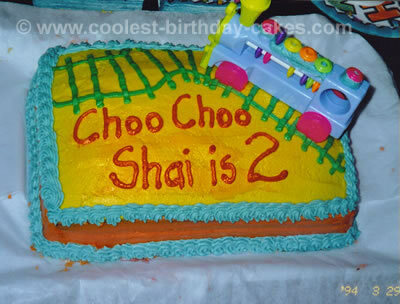 The Choo-Choo train cake is a combination of the many train cakes I found on this website. I used red velvet cake mix to make the train cars baking it in regular-size loaf pans. Be sure to spray the pans with nonstick spray! It is essential that the loaves not stick to the pan. Once the cakes were cooled I cut one loaf cake into three pieces: the first was approximately 4-5 inches in width and two others were equal smaller slices. The larger piece would be used to build up the engine car with the others going towards the design of the cars that followed. 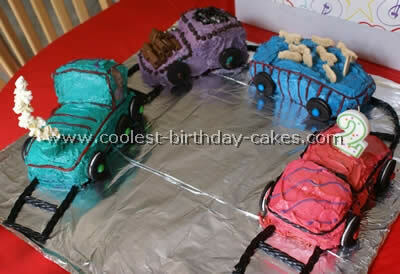 Next I used frosting to attach the cut pieces to the remaining loaf cakes creating a variety of shaped cars. I mixed up different colors of frosting for each car (using store-bought cream cheese frosting and neon-colored food dye) and frosted them accordingly. Then the fun part of the train cake began! Using frosting as the “glue” I added Oreo cookies for wheels on each of the cars, complete with color-coordinated M&M’s in the center of each. The engine car consisted of red Twizzler licorice that could be pulled apart into thin strips, a large marshmallow smokestack with popcorn threaded through a wire for smoke, a large gel-drawn “M” and a photo cut-out of Madison as the engineer. The second car was a combination: I had it carrying both logs (Tootsie Rolls) and coal (crushed Oreo cookies). I used chocolate chips to create a border around the different areas. The third car was the zoo car consisting of animal crackers and the string red Twizzler licorice to create the bars. This car was a favorite. The last car, the caboose, was pretty simple with black licorice windows on the sides, gel-drawn designs and the birthday candle. Finally I connected all of the cars together using black Twizzler licorice. Small pieces of toothpicks helped to keep them in place. The train cake was a hit! I am generally not crafty at all and although the cake did take hours to decorate I was proud of the results. Good luck with your own train cakes! For the engine, I used the Wilton, 2 piece 3D choo-choo pan. For the middle, “coal” car and the caboose, I used a regular, deep loaf pan. I cut just a bit off of the front of the caboose to make the top and back platform. To decorate: I used a star tip for most of the engine, filling up my disposable icing bags and using couplers for when I wanted to change tips. There are guidelines on the cake when you use the Wilton pan. 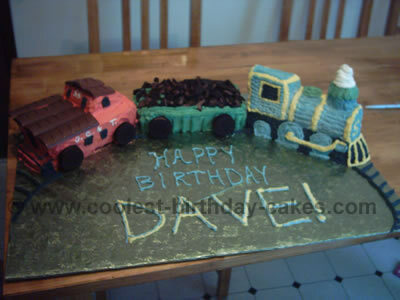 For the “coal” car, I used a spatula dipped in water to smooth the green icing, then star tip to put on the detail. The “coal” is crushed Oreos. For the caboose, I smoothed on the red icing, and then used chocolate bars and a star tip and black icing for the windows. The railings on the back platform are pieces of un-cooked spaghetti covered in black icing. You can poke the spaghetti right into the cake. The roof of the caboose is made of home-made chocolate bars, but Hershey ones will work just as well. The wheels on the engine are black icing, but the wheels on the other two cars are Oreo cookies. I also piped a black track onto the cake board for a finished look, also with a star tip. Mix the butter, shortening, and vanilla first, then slowly add your powdered sugar. Add milk to make it a bit creamier. Celebrating Joshua’s second birthday was the extension of a family tradition. 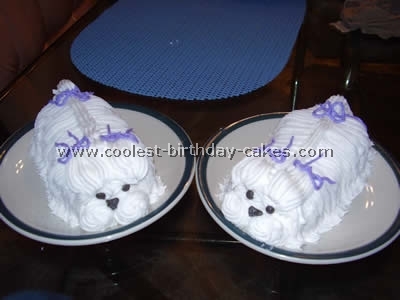 My mom always made train cakes for me and my brother for our birthdays. 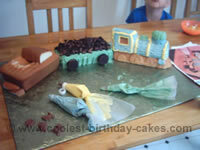 Mom’s train cake ideas were simpler but created with an equal amount of love! 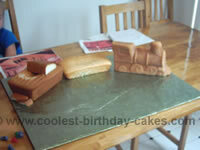 I made this train cake from 2 box cakes using the pound cake recipe so that it is easier to carve the shapes you need. Call 1-800 customer service number if the recipe is not on the box- they will give it to you over the phone. I cooked two cakes in the loaf pans and one cylinder cake was made in a green bean can (label removed). Then I filled all pans and can 3/4 full with batter. I cut the loaf cakes into train cars, but you could use mini loaf pans to make things easier. Grease and flour pans and can. I placed the can in an empty pan while it baked in case of run over. After the “can cake” is baked, allow to cool cut the other end of the can with a can opener and push cake through. Create your train cake tracks first with black licorice and chocolate covered waffle cookies (Keebler brand). For the ground cover I used ice cream nut topping as gravel or you can crush either graham crackers or Oreos, for dirt or sand. Or put some coconut in a baggie and shake with either green or brown food coloring to make grass, or straw for your ground cover. Use a large marshmallow for the smokestack, covered with frosting. The wheels are half of an Oreo cookie, glued on with frosting. The engine headlight is white frosting with cake glitter to make it shine. The lion cage is made with pretzels. I cut out the center of the cake to make room for the toy lion to sit. I filled the bottom of the cage with green gummy worms (for grass). Then I used pretzels and dipping chocolate (bark) to make the top of the cage. I dipped the pretzels and laid them out on wax paper while they dried into a rectangle. I laid the cage top on the top. (In the photo it was the 1st thing my son took off the train after we gave him the go ahead). The inedible parts of the train cake are the 4 toothpicks that hold up the red gummy worms that make the railings on the caboose, and the floral wire stuck into the smokestack to give the cotton candy smoke some support. (Add cotton candy right before presentation, any humidity in the air will turn it to slime!) The rest of the decoration is frosting. The “cow catcher” in the front of the engine is made out of cake and frosting. If your child is older you can use candy for more decoration. Gum drops, red hots, M&M’s, candy dots, and other choking hazards for small children. I have also made a coal car with heaping crushed Oreos, a lumber car made with large pretzel sticks, use your imagination!! You can have as much fun as they do. Give yourself 2-3 hours for decoration and assembly, more if you’re a perfectionist. It’s always a long night at our house! : ) It doesn’t matter how it turns out they will love it!! 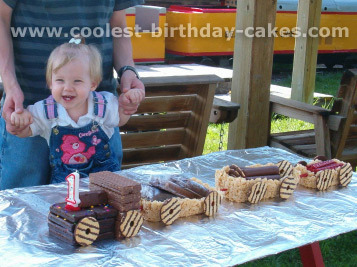 The best part of the train cake is the child’s face seeing it for the first time! 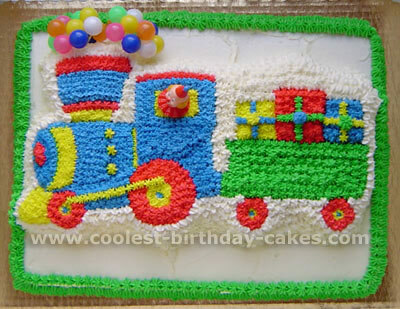 I know why mom groaned (all the work) and then agreed to make our favorite cake for many years… The Train Cake! 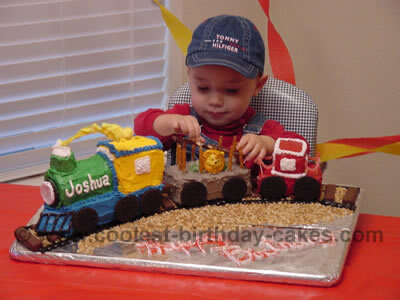 My kids love Thomas the train engine and after seeing the train cakes on this website I was encouraged to try. For the prototype I made an Engine and two carriages using pound cake with butter cream icing, spending half a day. The next day we tasted the cake and found that the butter icing had hardened and also dried up the cake. I colored the icing with liquid food coloring and the result was not too bad. I used a store bought “face” cookie for the Engine and my youngest child was convinced it was Thomas! 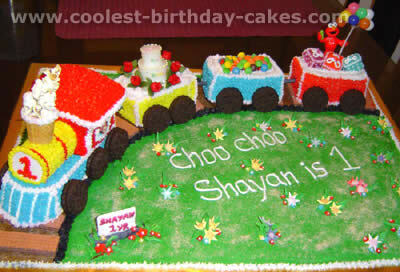 The kids at school loved the chocolate and candy treats on the train cakes! Note that unwrapped candy on the cake does melt after you remove them from the refrigerator the next day. The cake was also dry the next day even with the blueberry pie filling I sandwiched in the middle. Also, it took the better part of the day to bake 2 trays of 12″by12″ cake and the rest of the day to decorate the cake. In all, I spent about 10 hours on the cake. I told myself that next time, I’ll use store bought pound cake loaf to cut down the time. It was worth the labor though, seeing the pride in my family’s face at the train when it was fully assembled in the evening. 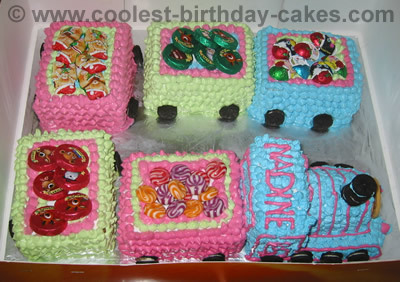 These type of train cakes are quite easy to make. I used two boxed cake mixes baked in loaf pans. Make four cakes and use the fourth to cut up for the engine and cars. I used Oreo cookies for the wheels and frosted marshmallow for the smokestack. I used various candies to load the freight cars. I made this cake for my son’s 3rd birthday. 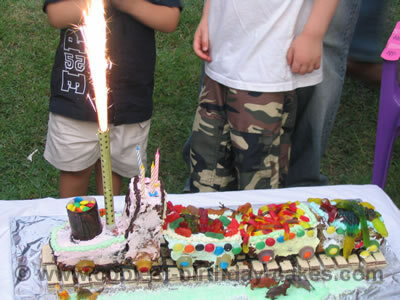 We had a choo-choo-train theme for his party complete with an actual scenic train ride with the Lebanon Railway. I used the Wilton train cakes pan for the engine and the cars were made with a bread loaf pan, and then cut in half lengthwise. I used Wilton sucker sticks for the bars on the zoo car and the top is a piece of cardboard that I iced to match the car. The animals and clown heads are also Wilton . I piped on the body of the clowns with butter cream icing (all of the icing is butter cream). I used the Wilton train cake pan for the main part of the train. Since there were going to be 25 people at the party, I needed more cake, so I made an 8″x13″ cake and cut it to form the second car and the caboose. This is my first cake for other people (not made just for me and my hubby), so I was glad it turned out so well! It actually broke in half when I was taking the cake out of the pan (first time that ever happened!) but it wasn’t noticeable once frosted. 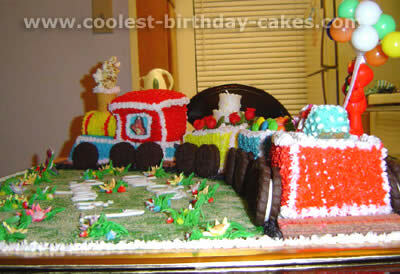 I made these train cakes using a Wilton shaped train pan, and a 1/2 sheet cake underneath the train. I used three French vanilla cake mixes for the entire cake. 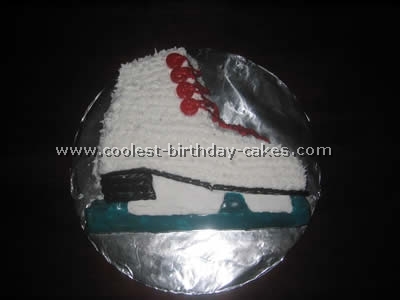 It was frosted in butter cream icing using mostly star tips for the top layer. After icing the train cakes I added 2 sets of balloons in the smokestack, and added a derby clown in the window of the train. 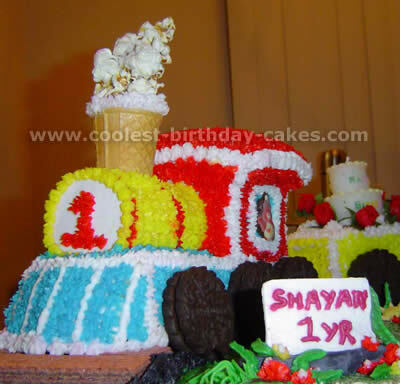 Train cakes are fun to decorate.